Players need to consume a certain amount of Energy to build buildings (except the Energy Station) in their home base. 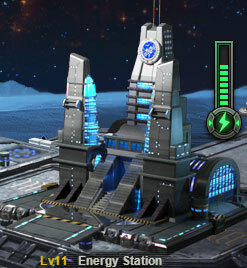 Thus, in the game, players are required to build an Energy Station first. The Energy Station will produce Energy over time. Upgrading the Energy Station can increase its Energy output. With enough Energy, players can build other buildings in their base. Therefore, building and upgrading the Energy Station is the prerequisite for other buildings in the home base.